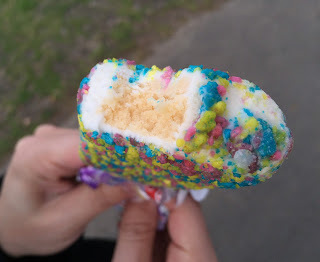 My husband kept saying he wanted to try birthday cake flavored ice cream that he had seen in Central Park from last year, and we did find it last weekend after riding a carousel in the park. 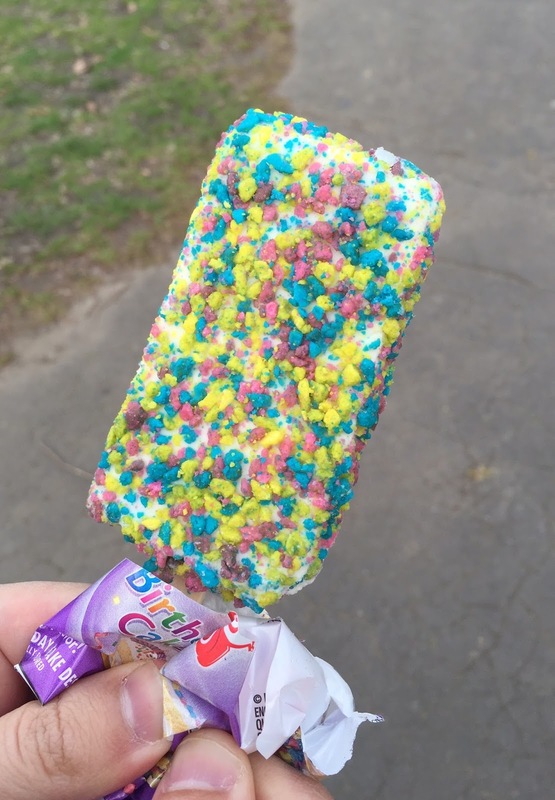 The package says, "Now with more birthday cake flavor!" but it's our first time to try this ice cream so that we wouldn't be tell any difference. There's an image of a quarter cut of the cake with layers of sponge cakes, whipped cream and purple decoration. The ice cream bar was as colorful as the image on the package, and the dots were yellow, blue, pink and purple. Unlike the image on the package, the inside wasn't 2-layered but it had sweet cake flavor. I'm not sure that birthday cake flavor exactly is, though it surely had eggy and sugary cake taste. The colorful dots on the surface seemed to be crushed sponge cakes and they're not firm.